If your order weighs less than 13 ounces, save huge on shipping with USPS first class (with tracking number). This product weighs 11.2 oz. 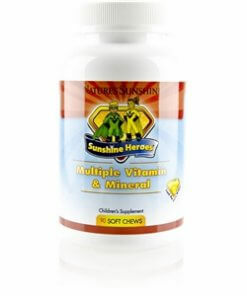 Nature’s Sunshine blends 50 to 100 percent of the children’s recommended daily allowance for 11 essential vitamins and minerals in Sunshine Heroes Multiple Vitamin & Mineral. 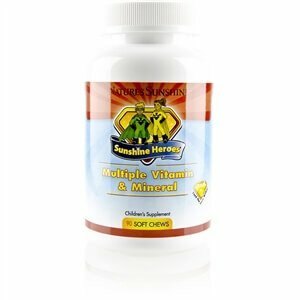 The formula provides nutrients that may be missing in a child’s diet or that may be depleted because of a child’s high activity levels. It includes whole foods, fruit juice concentrates, and micronutrients as well as antioxidants and phytochemical nutrients. Organic tapioca syrup, organic evaporated cane juice, organic tapioca syrup solids, pectin, citric acid, colors added (black carrot juice concentrate, purple berry concentrate, annatto), natural flavors, sodium citrate, organic sunflower oil, carnauba wax.